Fruit flies are some of the most annoying pests that often find a way into your home through your kitchen drains. Even though they seem harmless, they are not a good thing to have living in your house drains. They can consume everything and cover your whole kitchen with germs and bacteria. Sewer flies or more commonly known as fruit flies like to stay near drains and plumbing fixtures, hiding there during the day time. Other times you can find them hovering around your sink drains or trying to make meal out of your leftover garbage bins or fruit sitting out. â€¢Â Â Â Â Â Â Â Â Â Â Â Â Where are they breeding? Find out where they are laying eggs and spray the area with a bug exterminator and clean the area for nests. 3 Tbsp of Apple Cider Vinegar and 3 drops of dish soap in a cup and put it near your drain or counter. The flies will be attracted to the sweetness and get caught in the suds of the dish soap. Use cleaners like bleach, detergent in your drains where the source of the problem is. A sweating toilet bowl can cause mildew and mold growth in your bathroom. Toilet bowls sweat because the air around the toilet is considerably warmer than the temperature of the toilet water. This creates condensation and causes the toilet to sweat. You can purchase an anti-sweat toilet kit to insulate the tank and reduce condensation. Home Depot carries it for a reasonable price. To install,Â you completely empty the water from the tank, then use a hairdryer to ensure that the sides are absolutely dry. Cut the foam and apply adhesive. Let it sit for 6 – 8 hours and it will be ready to be refilled and useable. The kits are inexpensive, easy to install, and are very effective. The second option is to install a mixer valver which uses both hot and cold water to “mix” – you can adjust the temp as you want until it stops the condensation issue. Depending on how far away the hot water heater is, it may take quite awhile for the hot water to get there. In some cases, just running a hot water line is sufficient. This method works well but you may have to hire a plumber for the installation. Lastly and more expensive, is to replace the guts of the toilet and replace with a “pressure assisted” unit, like Flushmate – 1 gallon per flush. This option is a water saver and works very well – no tank sweating at all. You can always opt for a total toilet replacement – Pressure Assisted Toilet. The cost is aroundÂ $300 on up, but well worth it. This toilet has a pressure tank in it inside the water tank. Give us a call today at 888-800-2555Â and be sure to check out our website for our coupons. Find out what to look for in a quality plumber and get some guidance on what questions to ask your plumbing contractor on the pages below. You can also learn more about using low-flow toilets to help you conserve water and lower your bills. Does your plumber measure up? Look for reviews on Google and Facebook. Visit this page from EPA.gov to learn about using low-flow plumbing fixtures to conserve water at home. On this page from LRCA.org, you can see what practices can help conserve water and lower your water bills. Contact Du-All Plumbers at 888-800-2555 to learn about our superior plumbing services today. 1. Shut off all the water in your home. 2. Find the water meter box for your house. 3. Observe the meter; it shouldn’t be moving. You have a fast leak if your meter is moving. You have a slow leak if, after ten minutes, you see the meter move. For all your leaks, plumbing and septic issues, call Du-All Plumbing at 888-800-2555, or visit duallplumbers.com. Choose a company with decades of history in your local community. Long-term success for any company depends on consistent customer care and reliable serviceâ€”this service can guarantee flawless installations of your new bathroom fixtures. Professional installation methods also result in a better-looking bathroom and a greater boost to the resale value of your home. Homeowners are at a disadvantage when it comes to buying bathroom fixtures. Retail prices and generic designs can put a damper on any budget. Thankfully, plumbers have access to professional parts and resources. Homeowners can save big on the cost of parts and enjoy high-quality fixtures by choosing professional installation. Guesswork can bring bathroom fixture installations to a grinding halt. Donâ€™t count on a manual to walk you through tough bathroom repairsâ€”trained plumbers can have your new fixtures installed in a matter of hours. Plus, when you choose a professional, this installation speed never comes at the price of quality. A total bathroom fixture replacement project can take weeks. However, plumbers can work together to replace several fixtures simultaneously. The full support of an experienced plumbing team allows homeowners to transform their entire bathrooms in a reasonable amount of time. Professionals can also ensure that every piece of your new fixture set is a perfect match. Du-All Plumbers is the perfect choice for all of your plumbing and septic tank upgrades. We have over three decades of experience in the plumbing repair industry, and we are ready to help you update your bathroom. Call us at 888-800-2555Â to discuss your options for your home today! At Du-All Plumbers, we have seenÂ leaking problemsÂ everywhere in the home. Leaving leaks to fix themselves will harm your property, eventually causing extreme and costly damage. Leak detection does not merely involve finding a puddle on the floor. Remember, leaks can start behind walls and in underground pipes, places you canâ€™t see with the naked eye. Professional plumbing companies today use specialized equipment to detect these leaks before they become a major problem. There are several different methods used to detect a leak. Read about these popular methods below. Acoustic leak detection techniques allow technicians to quickly and efficiently locate hidden leaks. The sound sensor used gives the expert the ability to hear leaks in underground, pressurized pipes that he would otherwise not be able to hear. Every leak has a source; when a technician uses the equipment, listening from hydrants, valves and meters, he can pinpoint the location of the leak as the sound reaches its loudest. A detailed summary report on the leak detector results can be used for asset performance reports. Infrared technology has made leaps and bounds since it was first invented in the 1980â€™s.Â Today there are infrared cameras that fit in the palm of your hand. With this technology, technicians can detect leaks and wet spots in your home that cannot be seen with the naked eye. Infrared leak detection is non-invasive and, most importantly, quick and accurate. The technician injects gas into suspicious areas and seals the injection point with tape. The Tracer gas detectorâ€™s leak meter is fitted with a miniature sniffer to locate the route of the leakage. This method of leak detection is especially useful for finding micro leaks. Helium gas is used for applications with high sensitivity. During industrial applications, hydrogen gas is used. If your leak has already created a flood or the leak is suspected to be underwater, your technician will use the digital camera leak detection technique. The system flashes an ultra-bright LED light from the outside of your camera housing when a leak is detected. Going green at home can start with saving water. About 60% of all home water usage takes place in the bathroom. By installing low-flowÂ plumbing fixtures, you can save thousands of gallons of water. This video contains several tips for lowering home water usage. Â For example, you can use greywater from your laundry to irrigate your yard and lawn. Turning water off while brushing your teeth is a no-cost way to save, and regular maintenance and repairs of yourÂ plumbing related appliancesÂ will save you both water and money in the long run. If you would like to learn more about saving water and keeping your home’s plumbing system in good condition, contactÂ Du-All PlumbingÂ at 800-480-4100Â today. We provide the Palm Beach area with high-quality professional plumbing services. Homeowners are constantly tempted to toss daily one-use items down the train or toilet. Unfortunately, these products can quickly contribute to aÂ debilitating clog. Home plumbing is only designed to transfer water and flushed toilet paperâ€”any other product is liable to catch inside the drain. Keep all tissues, special wipes, feminine hygiene items, Â and cotton balls out of your drains. Diligence in monitoring what goes down the drain will help prevent clogs in your home. Small food particles are equally likely to collect in pipes and cause a clog. In fact, several appliances can contribute to these drain clogs. Dishwashers and garbage disposals, for example, collect food particles regularly. The particles are washed down a drain during regular use and eventually become a huge threat to your homeâ€™s piping system. Clean out and toss away food build-up in your appliances regularly to minimize these types of clogs. Some drain clogs start far along the pipe. Intrusion from tree roots, for instance, typically happens at a significant distance from the home. The solid precipitate from hard water salts can also begin to collect in any location along your drain. Choose a plumbing company that offers video camera sewer line inspections if you suspect a severe clog. The best way to deal with nasty clog is to call a trained professional. Count on Du-All Plumbers to take care of your householdâ€™s clogs 24 hours a day, seven days a week. We can be reached forÂ emergency or routine maintenanceÂ at 800-481-4100. One of the most obvious signs of a backed-up septic tank is the smell of sewage. These smells are strong and offensive; they typically emanate from drain openings and quickly spread to fill a room. ContactÂ aÂ septic tank repairÂ specialist if you detect sewage smells from your kitchen or bathroom sink. Catching a back-up problem early on prevents the chances of a full-blown problem down the road. 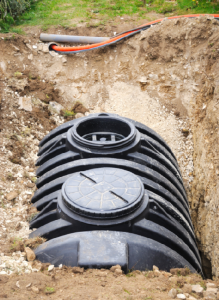 Your septic tank is designed to handle a certain volume of waste and water. This limit is determined upon installation and depends on the size of your family. Unfortunately, a few long-term house guests can quickly overload your septic tank and cause a problem. The same symptoms can occur if your family begins to become more wasteful with water. Consider having your septic system serviced if your monthly water bills jump sharply. Septic systems should be serviced on a regular basis to keep them in top shape. For example, make sure your septic tank is pumped at least once every three or four years. Failure to keep the tank empty will result in overflow and backup problems. If you havenâ€™t scheduled a check-up in over a year, this is a sign you may need to have maintenance performed. Call Palm Beach Countyâ€™sÂ Du-All PlumbingÂ at 800-481-4100 to have your septic system professionally pumped or repaired. We pride ourselves on our professionalism and our same-day service. Visit our website to learn more about our company or to review our plumbing services.